Baseball is a weird sport. Every single day the game will show you something you’ve never seen before, yet so much of what happens on the field is a repeat of something we’ve seen countless times before. We’ve all seen bloop singles and majestic homers and down-and-away sliders for a swinging strike. We watch for the weird, not the the history that repeats itself. So far this spring the weird has avoided Yankees’ camp, and that’s a good thing. Weird can be fun, but a boring run of the mill Spring Training is a-okay with me. History may be repeating itself on two fronts, however, and with the organization’s top two position player prospects. Miguel Andujar is trying to hold off Brandon Drury for the third base job and Gleyber Torres is trying to win the second base job. We’ve seen these movies before. The Andujar-Drury position battle is reminiscent of last spring’s right field competition between Aaron Judge and Aaron Hicks. Judge was the hotshot prospect who received a taste of the big leagues the previous year, and had a flaw in his game (strikeouts) that would’ve justified sending him to Triple-A. Hicks was the talented “young veteran” the Yankees were clearly enamored with. They thought he had more to give than what he’d shown to date. This spring Andujar is Judge, the highly regarded youngster with an obvious flaw (defense) that could land him in Triple-A. Drury is Hicks, the talented “young veteran” the Yankees like quite a bit. Last year Judge and Hicks both had strong springs, but Judge won the right field job. It only took a few weeks for Hicks to force his way into the everyday lineup though. The Yankees could’ve gone either way with the right field job. Eventually talent won out and both were in the lineup. As for Torres, his spring reminds me of Gary Sanchez circa 2016. The Yankees traded John Ryan Murphy (for Hicks) during the 2015-16 offseason, and the assumption was Sanchez would get the backup catcher’s job behind Brian McCann. Then Sanchez went 2-for-22 (.091) during Grapefruit League play and wound up back in Triple-A. Gary mashed in Triple-A, joined the Yankees in August, and has mashed ever since. Gleyber is off to a slow start this spring, going 3-for-19 (.158) at the plate with a few defensive miscues, and there’s already talk he’s losing ground in the second base race. Sanchez was not coming off a major injury like Torres is now, though their situations were similar. They were both top prospects expected to seize a wide open roster spot, though their springs were unimpressive. Heck, we were even talking about delaying Sanchez’s free agency back then — remember all the talk about 35 days in the minors? — like we are Gleyber’s now. There are still three weeks to go before Opening Day and thus plenty of time for Torres to turn around his spring and mash his way to the second base job. The kid is coming back from a major injury and a long layoff, after all. That he needs a little time to shake off the rust isn’t unexpected. Point is, Gleyber wouldn’t be the first top prospect with a clear path to a big league job to blow it in camp. Sanchez did it two years ago, and he turned out just fine. With Andujar and Drury, the Yankees will ultimately go with whoever gives them the base chance to win the same way they did with right job last year, and it is entirely possible the best chance to win involves having both Andujar and Drury in the lineup. That’s what happened with Judge and Hicks. If they force the issue, the Yankees will make it work. Maybe Drury goes to second, maybe an outfielder sits and Andujar is the DH. But if both show they belong in the lineup, they’ll be in the lineup. Two years ago the Yankees traded Murphy to open a roster spot for Sanchez, and he couldn’t seize it. At least not at first. This year the Yankees traded Starlin Castro to open a roster spot for Torres, and right now he is on the path to Triple-A, not the path to the Opening Day roster, and that’s fine. Going to Triple-A for some fine-tuning isn’t the end of the world given his age (and the injury). Sanchez showed that path can be a bump in the road, not a dead end. Everything gets magnified in March even though we all know better. Andujar looks like a world-beater and oh gosh they have to put him at third base and sign him to a long-term extension. Torres struggles in his first handful of spring games and the Yankees better send him to Double-A, just to be safe. This sorta stuff happens every year. 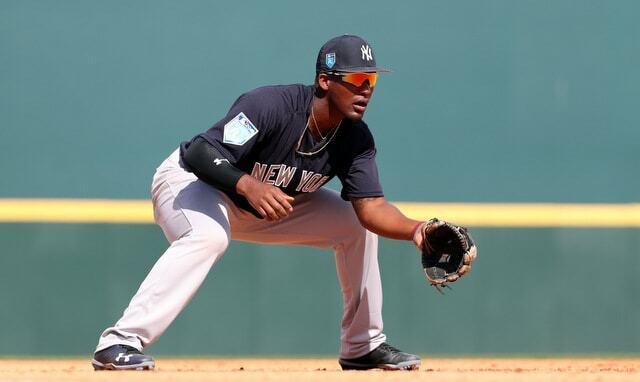 We needn’t go back far to see the last time a top prospect like Torres struggled in the spring, or the last time the Yankees had two very good candidates competing for one roster spot like Andujar and Drury. History tends to repeat itself, so we can look to the (recent) past to see how the Yankees handled situations similar to Andujar-Drury and Gleyber-second base. The answer is, boringly, the best players will play. If that means shoehorning both Andujar and Drury into the lineup, or giving Torres more time in Triple-A so he can be the become the best player possible, so be it. This has all happened before and things worked out very well for the Yankees and the players involved.